Feng shui is an ancient philosophy combining both art and science, developed over 3,000 years ago during the time of the Chinese renaissance. 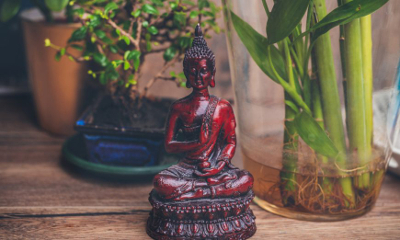 It is a simple and effective way to transform your home and surroundings into a better place to live in, by increasing positive vibrations, opportunities and prosperity, bringing luck and overall, creating a good energy around you. The benefits aren’t necessarily something that can be seen, but felt. In order to create a new and healthy environment, it is important to begin by first getting rid of old energy. By throwing out and clearing all unwanted pieces from your home, which are no longer of any use, for example cleaning out your garage or rearranging desks and drawers will help your body and mind to relax, and thoughts and ideas flow freely, leading to improved decision-making ability. Darkness will never be an open door to a successful feng shui. Good air quality for breathing and smart lightning are essential. Your body attracts everything around you, so it either sustains or drains it. The bagua should be first observed and studied. It speaks about the areas of the house which are connected to the areas of your life, for example: career, wealth, creativity, spiritual growth, luck, happiness, prosperity and joy. The bagua is a guide on how to organize the ‘8 areas’ of your home. Colors are very important in Feng Shui, each being attributed a specific set of energies or moods, as well as an element. Choose color carefully, keeping in mind the bagua of each space. The five elements responsible for creating and benefitting your feng shui positions indeed have a great impact. Living things indicate a growing vibe in your environment. This includes such things as bonsai plants, flowers, pets and fish, as well as other items such as bamboo frames, mirrors and cascades. Positioning, Decoration and Furniture – The best time to start thinking about feng shui is before the house is even built; incorporating it into the very design and architecture of the house, by placing bedrooms and other areas of the house following the bagua method. On the off chance that you wish to include a wellspring in your home, which is a water component, place it in the bagua regions that gain a special advantage from water, for example, North, East and Southeast regions of your home. The objective of feng shui inside the home is to adjust the positive and negative energies not only inside the space, but also inside yourself. This will bring congruity, serenity and prosperity. Be mindful of how and where you place your things, in order to create the best possible environment.